This month we continue our series of posts on sedges. 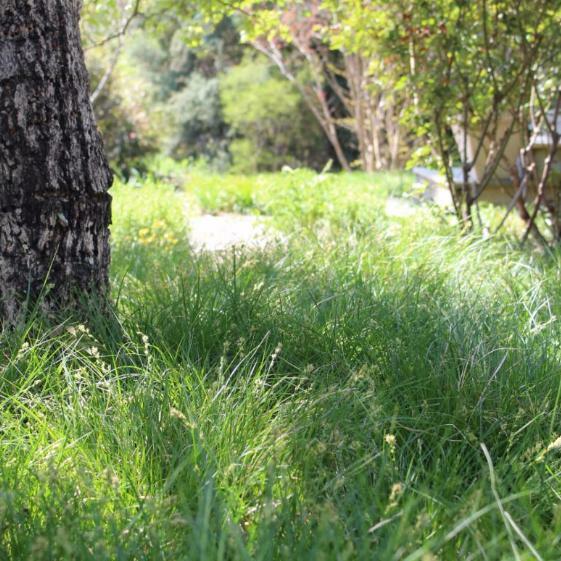 You'll learn about sedges for a range of uses, from rain gardens to alternatives for turf grass lawns. We think they make sense for your growing program and for anyone interested in green infrastructure and the ecological landscape market. 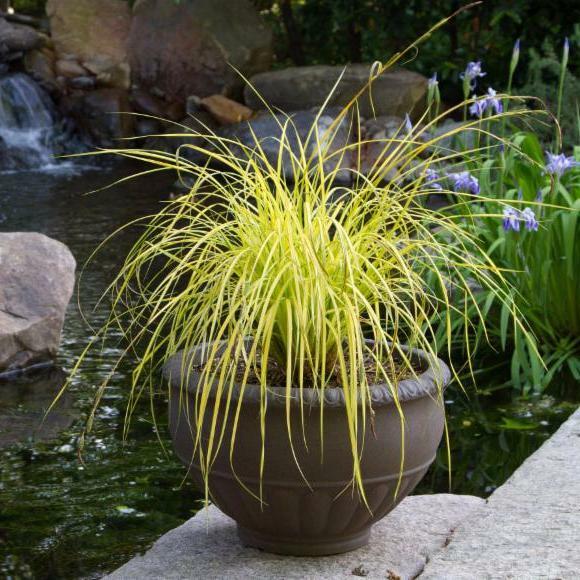 Carex from Asia, New Zealand, and Europe have been in the horticultural trade for decades. Because they were some of the first sedges sold commercially, they tend to be showier than our native species. Many sport bright colors and snazzy variegation, and they look fabulous in containers. Read more. The High Line in New York City has linked infrastructure reuse projects across North America. With overviews of 19 projects that are adapting existing places and using green infrastructure, it's a must read. Check out Atlanta, Dallas, and more! Our new Carex comparison chart makes choosing even easier! Dive into Sedges with Our New Catalog! It's pretty clear we're crazy about Carex. They're growing in popularity, and we often have customers tell us they'd like to learn more about them. To share our knowledge and enthusiasm, we have dedicated our 2017-2018 catalog to sedges. 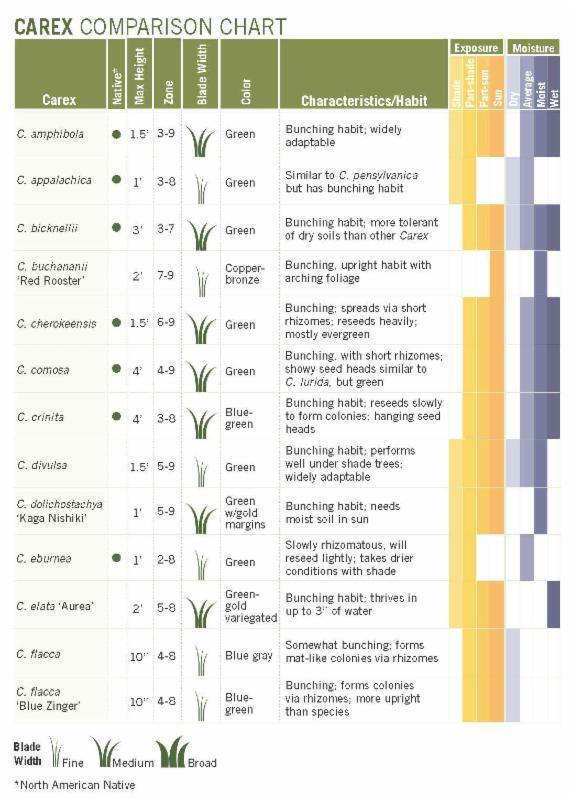 The 35 Carex we grow are highlighted in a new comparison chart. It outlines habit, spreading tendency, foliage texture, and other key characteristics. We think sedges make sense for your growing program or landscape project, so we hope this chart makes them less of a mystery. We are only weeks away from having the new catalog in hand. That means you're only weeks away from diving deep into Carex. Pick up the new catalog at Cultivate'17 in Booth 3013. If you're on our mailing list, look for it in July. If you're not already on our mailing list, you can request a catalog here. Nursery Management did Q&As with several speakers on the educational program for Cultivate'17. 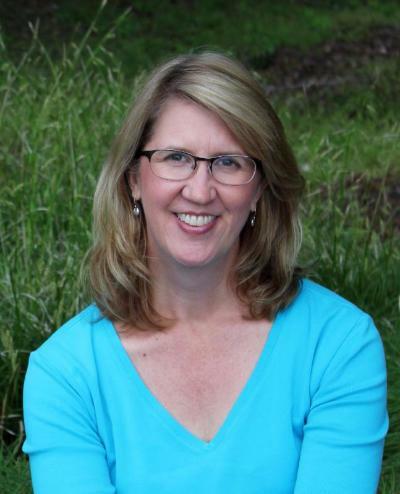 Hoffman Nursery's Marketing Director Shannon Currey talked with them about her upcoming presentation, " Growing with Green Infrastructure." Shannon talked about what green infrastructure is, how Hoffman Nursery got involved, and how growers can explore this emerging market. 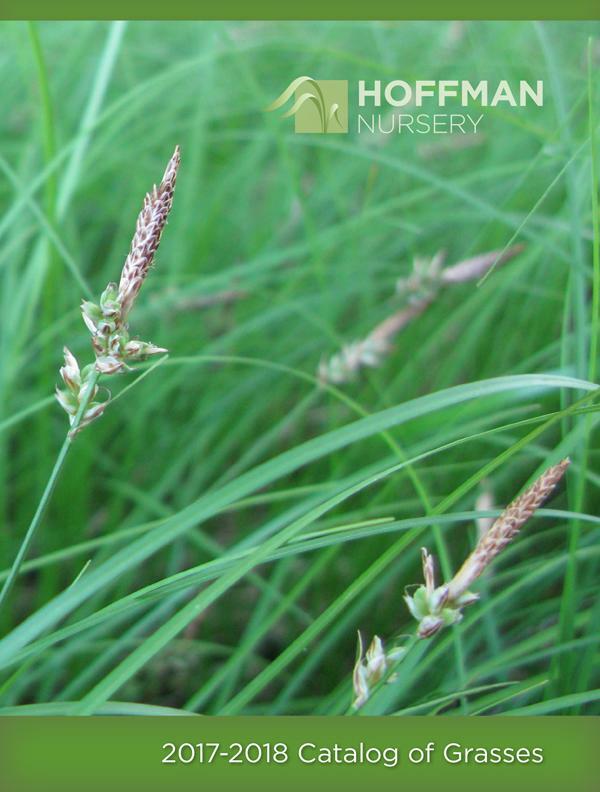 In past newsletters and posts, we've highlighted sedges and low-growing grasses for matrix plantings. Just what does that mean? The New Perennialist discusses what he means by "matrix" and discusses how it works within modern planting design. Dr. Jared Barnes brings an intensity and joy to horticulture that is infectious. As Assistant Professor of Horticulture at Stephen F. Austin State University, he engages students in hand-on learning with enthusiasm and expertise. He became interested in the current movement toward designed plant communities and mixed perennial plantings. That led inevitably to a student project to create what Barnes calls "food prairies." 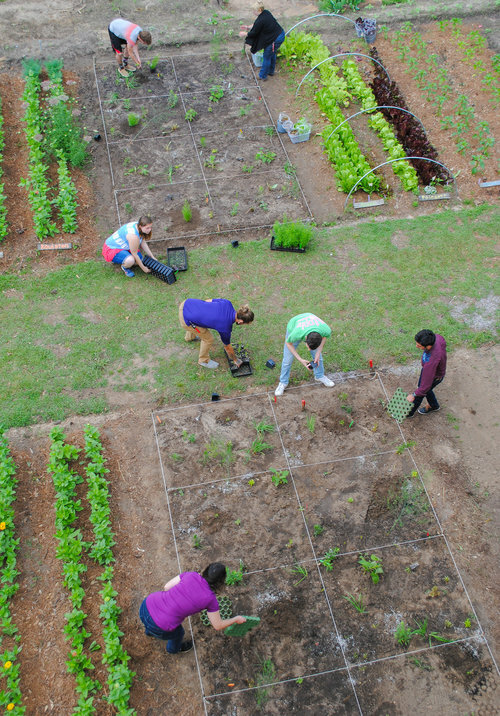 The concept mixes perennial plantings among the beds of their student-run vegetable garden. Barnes' goal is to implement the planting styles and methods used by Piet Oudolf, Roy Diblik, Thomas Rainer, Claudia West, and others using plants adapted for the Southeast. Barnes describes this process in a series of blog posts. He deftly mixes practical considerations and details with the ideas that drive the project. Hoffman Nursery grasses and sedges are in the mix. We will be following to see how the food prairies progress. You can always find out where we'll be and what's going on with our Upcoming Events page. Cultivate is almost here! A renovation at the Greater Columbus Convention Center has everyone excited—new space, new events, and new spots for all the exhibitors. Find us in our new location at Booth 3013. Sat., July 15, 2:45pm-3:45pm: "Growing with Green Infrastructure"
Sun., July 16, 10:30am-10:50am: "Upgrade Mulch with a Grass & Sedge Package"
Tue., July 18, 9:30am-10:30am: "Let Sedges Do the Work"
Nursery Management did an interview with Shannon about the green infrastructure talk. Read the Q&A to find out more about this upcoming presentation. Explore the big event and get registration information here. It's one of our favorite events of the year. Bring together people from all over who grow, sell, use, and admire perennials, and you've got a fantastic week. 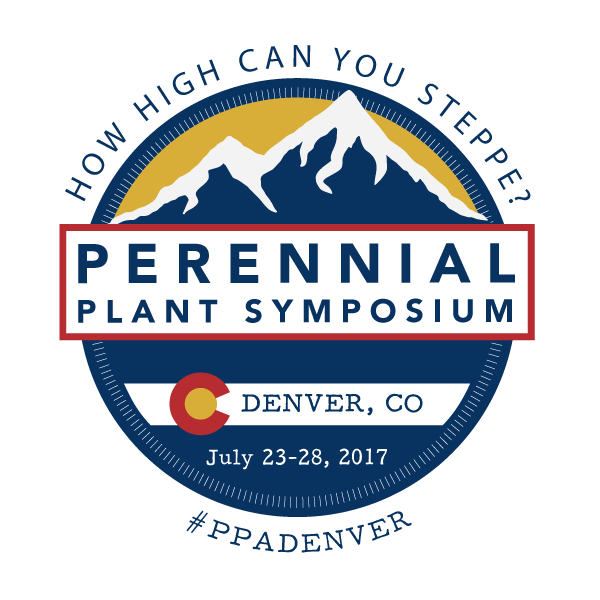 This year's symposium is in Denver, and that will give many of us a whole new plant palette to admire. Tue., July 25, 4:45pm-5:30pm - "Grasses and Sedges from the Ground Cover Up"
To see the entire schedule and register, go to the symposium homepage.